Species or genera that are widespread, abundant, and dispersive resist extinction in both marine and terrestrial environments and both fossil and contemporary lineages (Jablonski, 1986a,b, 1987, 1991; Gaston, 1994; Hubbell, 2001; Jablonski et al., 2003a). In addition to geographic range, which is sufficient on its own to explain species survival (Jablonski and Hunt, 2006), the presence of long-lived larvae and species richness of the clade confer resistance to background extinction in fossil marine bivalves (Jablonski, 1986a, 1991). Broad distribution of the clade confers protection against mass extinction (Jablonski, 1986a, 1991, 2007; Powell, 2007a). In addition, latitudinal distribution affects extinction, with the tropics— especially reef faunas—being subject to repeated upheaval, particularly during mass extinctions (Jablonski, 1991, 1993; Powell, 2007b). In stomatopods, evidence of extinction is derived from conspicuous gaps in regional distributions. For example, when a lineage occurs in the IWP, East Atlantic, and East Pacific but is absent from the West Atlantic, the most parsimonious explanation, given what is known about Cenozoic extinctions in the Americas (Jackson et al., 1996; Budd, 2000; Jackson and Johnson, 2000; Todd et al., 2002), is that it became extinct in the West Atlantic. Such ''apparent extinctions" are significantly elevated in lineages with restricted dispersal and small ranges as well as those from coral reefs and tropical latitudes (Reaka and Manning, 1987a). Although adult body size is not significantly associated with such gaps, small body size correlates significantly with reduced larval dispersal and small geographic ranges and can be used as an indicator of extinction risk (Reaka, 1980; Reaka and Manning, 1987a). 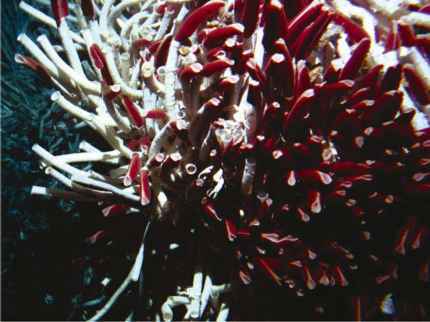 Speciation also is related to life history characteristics and geographic range size. Although the relationship between geographic range size and speciation has been debated (Rosenzweig, 1995; Chown, 1997; Gaston, 1998; Gaston and Chown, 1999; Jablonski, 2007), range size is positively related to dispersal ability and gene flow in many marine and terrestrial taxa (Reaka, 1980; Reaka and Manning, 1981, 1987a; Jablonski and Lutz, 1983; Jablonski et al., 2003a; Paulay and Meyer, 2006), and these factors tend to dampen rates of speciation (Mayr, 1963; Hubbell, 2001; Jablonski et al., 2003a). Paleontological approaches allow measurement of both speciation rates and geographic range sizes over time. Range size is significantly inversely related to speciation rates in fossil gastropods and brachiopods (Jablonski and Roy, 2003; Jablonski et al., 2003a; Jablonski, 2007; Powell, 2007b). Because it constrains reproductive traits and geographic range, body size can be used as an indicator of speciation rate. Evidence that small-bodied species are engines of diversification comes from studies of morphological and taxonomic divergence of stomatopod lineages across bio-geographic barriers (Reaka and Manning, 1981, 1987a). Large-bodied lineages and those with long-lived larvae remain conspecific (morphologically indistinguishable) or closely related (cognate species) when separated by a barrier (e.g., the Central American isthmus) significantly more frequently than small-bodied species with abbreviated larval development. Conversely, the percentage of endemic species without cognates elsewhere and the percentage of species within locally radiating clusters of species (more closely related to each other than to any species outside the region) are significantly elevated in lineages of small body size, of limited larval dispersal, and from reefs. Meyer, 2003; Meyer et al., 2005). In addition to the fact that most benthic reef species are small in body size (Reaka-Kudla, 1997; Bouchet et al., 2002; Meyer et al., 2005) with restricted or moderate colonizing ability, the behavior of reef larvae further reduces dispersal. Stomatopod larvae (and those of most other reef taxa) exhibit diurnal vertical migrations, hiding in reef rubble by day and migrating into the water column at dusk and dawn (Robichaux et al., 1981), which reduces exposure to currents. Although panda clownfish have a 9- to 12-day pelagic phase, one-third of marked juveniles settle within their natal area, many within 100 m of their birth site (GP Jones et al., 2005).